All sand filters use the same basic mechanics: when set to Filter, water flows from the pool, through the filter, and back into the pool. The sand inside the filter system blocks debris, dirt, and oil. A typical sand filter multiport system has 6 different settings – Filter, Backwash, Rinse, Circulate, Closed, and Waste. However, when you vacuum your pool a concentrated level of dirt and debris get deposited into the sand – the result being that the sand becomes dirty and clogged with contaminants that, if left unchecked, will reduce the sand’s ability to filter and, ultimately, simply end up back in your pool. Backwashing prevents this. The backwash reverses the flow of water, lifts up and flushes the sand, and then expels the dirty water via a waste line into the ground or drain. In order to ensure against residual blowback into the pool, once you’ve finished backwashing it is highly advisable to rinse the filter. Just as the backwash lifts and flushes the sand, the rinse reseats the sand in its original position for optimum filtration. Set the filter valve handle to the BACKWASH position and ensure the handle locks in place. Turn on the pump and backwash for 2 minutes or until the water in the sight glass (located on the filter) is running clear. Set the filter valve handle to the RINSE position and ensure the handle locks in place. Turn on the pump and run the rinse process for 1 minute or until the water in the sight glass is clear. Close the skimmer valves to prevent water from entering the filter from the pool. Empty the filter skimmer basket and clean out the hair catcher. Re-seat and seal the skimmer basket and hair catcher. Reset the Filter Valve to Filter and ensure the handle locks into place. Also, if your pool is particularly prone to leaves, more frequent backwashing may be necessary since leaves, other debris from trees, and contaminants from birds etc. will be entering your pool. But, you can also tell when it is time for a backwash by checking the sand filter system’s pressure gauge. Normal operating pressures are between 50 and 75Kpa (kilopascal). When the sand gets dirty and clogged up, however, the pressure reading rises. If the Kpa pressure on the gauge is showing north of 80Kpa, it’s time to backwash. If your pool contains an unusually high level of dirt (for instance, as a result of a nearby construction site, a protracted period of being untended and uncovered, or possibly from runoff caused by flooding) it may be advisable to by-pass the filter entirely. This is also the case if your water had, or has had, an algae problem. 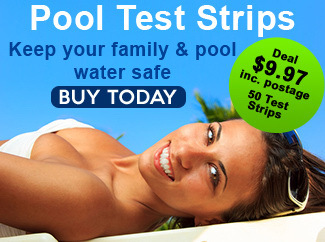 Live algae easily pass through the filter sand and re-enter the pool. And the same goes for dead algae following a shock treatment. In these cases, instead of vacuuming and backwashing, it may be better to vacuum directly to WASTE, and to send the vacuumed water directly down into the drain. The one downside of sand filter backwashing is that, because water is expelled from the system and sent into waste, is that it…well…wastes water. While this is unavoidable, the key to not overdoing the backwash process and flushing out more water than strictly necessary is to keep a careful eye on the colour and quality of the water in the sight glass. Don’t backwash more than necessary, or for longer than necessary. 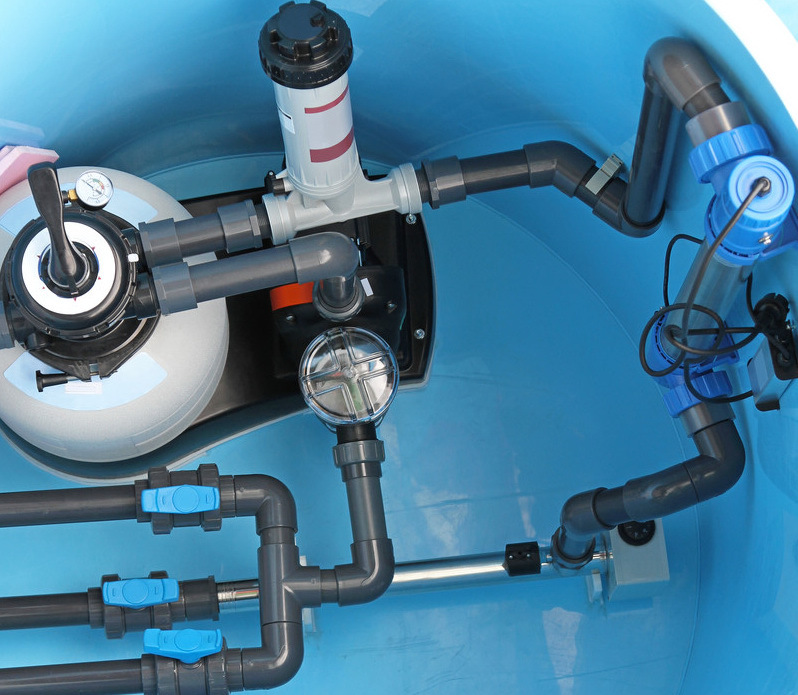 Sand filter systems operate most efficiently during the middle of the filtration cycle. This is partly due to the positioning, at any given time, of the sand in the filter, and partly because of the cyclical build-up of collected dirt and debris in the filter. The net effect is that too much or to frequent backwashing actually reduces the sand filter’s efficiency. Because backwashing inevitably washes out some of the sand along with the dirt and debris, from time to time it will be necessary to top up the amount of sand in the filter. When you do add extra sand, run the filer system on RINSE for a minute or so to reduce the amount of sand blowback into the pool. Finally, absolutely make sure you always turn off the pump before you either mover or reset the filter valve setting. If you do, you’re going to damage, and maybe destroy the system. Do you ever need to change the sand in a sand filter? My semi above ground liner pool is constantly murky. The filter seems to be working fine and has a lot of pressure when you see water going through but the pressure gauge is always sitting just above zero? Seems something’s not right somewhere. We’ve drained, cleaned, refilled, back washed and all chlorine, ph, alkaline and stabiliser levels are fine. The filter is only about 8 years old. Help!!!! Yep you should change the sand. The sand loses it’s edges with time. Most filter manufacturers recommend every 3-5 years. Every 5 years is fine. A very awesome blog post. We are really grateful for that blog publish. There’s also a lot of approaches after visiting your publish. I used to be exactly looking for. Appreciate such publish and please keep writing. Great work. Glad to hear you find the site useful! Looks like I’ve been doing it wrong! I thought back washing removed all the sand so I always added it all (4 & 1/2lbs) each time I back washed. Then again I only back washed once twice a month max during the season. I primarily vacuum with the robot so not a lot of debris ended up in the filter. Thanks for the tip! This is very well written and informative! We have a new filter and pump that was just installed for out 30,000 gal inground pool. The previous owner told me to only backwash if I saw air bubbles coming from the jet. I’m confident after reading your post that we will be able to properly clean and care for our pool. Thank you for taking the time to write and post this! We have a new pool. We are in the deep south with an infinity edge pool. Our gardener back flushed the sand filter drawing water from the over flow canal. It seems the dirtiest water available! Shouldn’t we be drawing water through the filter from the skimmer near the top of the pool the water is clean, sending through the filter to waste and not from the overflow canal where all the bugs and detritus id caught? (he did vacuum the entire pool first through the filter including the canal). So the water in the overflow wasn’t as dirty as usual. Our current pool (Expert) continues to do whatever he feels is correct with the maintenance of our in-ground cement pool. A couple of months ago, I caught him using the multi port valve whilst he had the pump running, I gave him a reprimand, though unfortunately the fairly new sand filter was damaged soon after & had to be replaced ??? We have needed 2 rebuilds on the pump already & a new replacement just yesterday, this morning during his twice weekly visit he had the pump on & off 6 times within 5 minutes ??? Another issue, instead of using the Manual / Start switch on the control panel he turns the timer control to an ‘ON’ sequence to vacuum etc,. So after every visit I have to physically reset the pump timer otherwise the pump / water feature & pool lights are not in sequence. Fire that pool guy and hire someone competent or take over maintenance yourself. Yes, learn to check your own water chemicals, and get an autovac system. No need for pool up. Take 10 min to throughly check your water chemicals. how come we back washed was ok but when we put the pump back on it started back washing again automatically. If your filter valve is set to filter, and you are still losing water out of the backwash valve, the seal in your control head is damaged. We are having a major water shortage and so I am reluctant to backwash any water out of the pool. Can I backwash the water back into the pool but first through a mesh filter or something ??? I change mine yearly. The cost of changing is minor compared to a sand filter that is inadequate. I’m surprised your 15 year old sand is even capable of filtering. I just looked over your post again. Sorry. Your “filter” doesn’t need to be replaced unless it is damaged in some way.